Two new studies have shed light on the health of Busselton's waterways. Researchers from Murdoch University spent time in the iconic Vasse-Wonnerup estuary, surveying introduced fish species and measuring nutrient levels in the sediment. The introduced fish study and removal program, funded through the Caring For Our Country program, found that introduced fish species were thriving. "In the estuary, we found 29 species of native fish, along with two introduced freshwater species," said Dr James Tweedley, of Murdoch University. "Sadly, we found the highly invasive Eastern Gambusia in the estuary and in all four tributary rivers too." 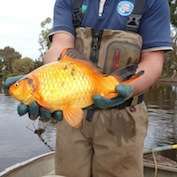 The study also found that goldfish, which are not native to the area, seasonally invade the estuary following winter rains. "These goldfish are highly mobile and seem to be able to tolerate saltier water," Dr Tweedley said. "The big concern is that this ability could see goldfish using the estuary as a 'bridge' to colonise other rivers." To track the goldfish, researchers used the same acoustic technology used to track Great White Sharks off the WA coast. The information gathered will assist future efforts to eradicate the species from the Vasse River and estuary. The second study, funded by the South West Catchments Council, found that the levels of nutrients in the estuary are a cause for concern. "The sediment we analysed from the bottom of the estuary was high in nutrients. But sediment collected from the water itself had up to 16 times more nitrogen and phosphorus," Dr Tweedley said. "If these high levels of nutrients continue, it could result in a collapse of the sea grass meadows in areas of the estuary, with flow on effects to the rest of the ecosystem."